It’s been said that competition dancers should train in similar shoes to those they wear in competitions. This keeps training in consistent heel heights and style of shoe worn without the need to adjust. The flip side of the argument is that daily training for hours does take its toll and brings on premature and avoidable injury. This is of particular relevance to professionals, coaches and instructors that dance long hours for a living. Many social dancers also prefer to learn in practice shoes, and save their heels and party shoes for dance parties. 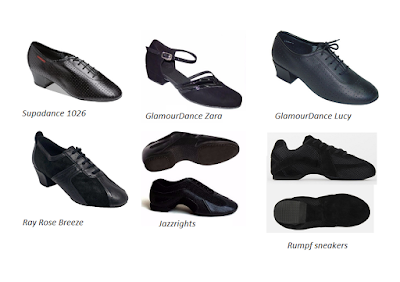 Practice shoes provide greater comfort than normal dance shoes in that they are made with lower, wide base heels, hold the foot in securely, and have fewer pressure points. They are usually made of soft leather and/ or breathable mesh. Below are some styles on offer for your consideration. Ask about fabric and colour choices.